Anchor outside the school door. Lines from the song, School Days, by Gus Edwards and Will D. Cobb, 1907. It’s been said that if the walls of old buildings could talk, imagine the tales they could tell. The East Smithfield Library is a case in point. Originally built as an elementary school in 1908, the sturdy brick building once known as the Dorothy T.P. Dame School has stood silent witness to more than a century of change. If they could talk, the walls of that vintage building might recount many a child’s first crush; the enthusiasm of a playground adventure, or even a time when students brought apples for their teachers. They might also relate the sentimental farewells bade by generations of children moving on to the next phase of their lives. In later years the old school served as a community center, and by the 1980s it was a library. It was during its conversion to a library that someone discovered the building had been keeping a charming secret, for hidden behind some old blackboards, were some even older blackboards, on which was a message from the past; a hail to the future from a long ago teacher. Most elementary school teachers in 1931 were women, so I will refer to this unknown educator as such. Perhaps she had an interest in history, or was someone who thought about the future in terms of the past. Unfortunately, we will never know, for her name was not recorded, nor was her motivation. Maybe she did it just for the fun of it, or as a way to say “hello” to some future generation of students yet to be born. In any case, she carefully covered the slate chalkboards of her classroom with artwork of her own doing that included, among other things, flowers, musical notes, and rabbits. More importantly were the names of her students, each carefully written, and what was perhaps a phrase she used to instill confidence in her pupils, “Not I Can’t, But I Will Try!” After that she wrote, “Class of 1931”. Even though eighty years have passed since her words were written, there are certain things that can be deduced. It was likely the end of the school year, for otherwise what she wrote would have been lost to the following day’s lessons. When the last bell rang signaling the freedom of summer, the class of 1931 filed out. Although the warm weather no doubt beckoned, the parting was likely bitter-sweet, for the class of ‘31 would not be returning in the autumn to the school they had come to know for the last six years of their young lives. Instead they would all attend another school to begin the 7th grade. The original chalkboards of 1908 were set into the plaster of the walls when the school was built. 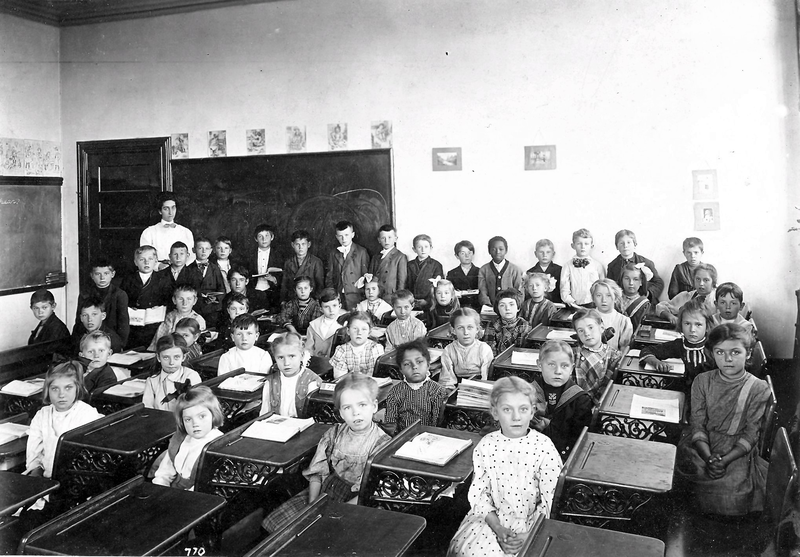 Not long after the 1931 school year ended, they were covered by new ones. Those doing the work had either been requested to leave the old ones as they were, or saw no reason to expend the effort to erase them. In either case, that un-named teacher’s work became a time capsule of sorts that lay hidden and forgotten. Generations of children came and went afterwards, sitting in the very same seats, or at least the same classroom, as the Class of ’31. In January of 1985, as renovations for the library were underway, workmen discovered the long forgotten treasure. Although decades old, it was reported that the chalk lettering looked like it had been scrawled just the day before. Writer Doug Hadden recorded some of the names in an article he wrote soon after the discovery: Winetha Pechie, Nellie Green, Veronica Tobin, Doris Schenck, Rose La Tour, Dora Provost, Donal Joya, Albert Hudson, Odelon Jolly, Angelina Moffit, Leo Monfits, Russell Chalmiers, Leo Fortin, Emilio Morselli, and Casare Bruno. Unfortunately, the rest are lost to history, at least for the time being. The Class of ’31 would have been born about 1919 or 1920. They entered elementary school at a time when Prohibition was the law of the land, and left at the start of the Great Depression. Coming of age during the Depression would have made them used to sacrifice and doing without. It was a simpler time when teachers focused on basic learning. There were no televisions or computers in the classrooms, and sending mail meant writing with pencil and paper. The class of ’31 could not have conceived of the luxuries afforded the students of today. By 1942 the Dame School Class of ‘31 was doing their part to help win World War II, and went on to become what famous newsman Tom Brokaw has dubbed, “The Greatest Generation”. It’s likely that many of the boys names found on those blackboards can also be found on local war memorials. At the end of the war, the same Class of ’31 settled down to jobs and careers, married their sweethearts, bought homes, and started families. Some probably remained in Smithfield throughout their lives while others moved away traveling far and wide. Fate would bring each to fulfill his or her own destiny. Their generation witnessed the greatest advances in technology of any that had come before them: the advent of television, personal computers, jet aircraft, and even space travel, just to name a few. By 1985 they were in their mid-sixties, getting ready to retire and start enjoying their grandchildren. Today, those who remain would be entering their nineties, and possibly enjoying great-grandchildren. “Not I can’t, but I will try!” Hopefully, they carried those words with them as they went through life, for that long ago teacher was trying to instill a valuable lesson; it is better to try, than to never try at all for fear of failure. She knew that even if her students didn’t succeed in everything they did, they could one day look back on their lives with the satisfaction of knowing they had made the attempt, instead of wondering, what if? The year 1985 was not so long ago in the scheme of things, but time enough for another generation to be born, go to school, grow up, and now be at an age where they are ready to make their mark on the world. Each will walk a different path through life, and the journey will be easier for some than for others, but the words of that long ago teacher can still apply. As to the East Smithfield Library, the hallways that once echoed with the shouts and laughter of school children are now comparatively silent, as any library should be. The long forgotten blackboards still exist, although they now lay hidden beneath a layer of drywall that was carefully applied by workmen when the old classroom was converted to office space. The chalk words and drawings are likely still as clear as the day they were written, waiting for a time when future renovations will once again bring them to light.